It isn't easy to develop effective outreach materials to recruit women to STEM and CTE! To help you we have developed these easy to use templates for a Women in STEM brochure for your program, a recruitment presentation, a flyer that describes your program and has a picture of a female role model, a Women in STEM section of your school's website, and more. You just have to fill in the blanks in the templates with the information from your school's programs and then we've done the work for you! Bulk License: Find out more about providing a license for your whole school, district or state. "I am not the most experienced person in Publisher...if I can do this, anyone can! You cover the questions that women will want to know -- and this information should be located in one convenient place -- such as the brochure!" All products and strategies are based on best practices from the eight colleges in the successful NSF-funded CalWomenTech Project. Female Role Model Questionnaire: Learn exactly what to ask role models to develop an outstanding biography or video interview that will excite and engage female students in STEM. Role Model Photo and Quote Guidelines: Learn how to obtain an inspirational quote and photo from female role models. Program Information Worksheet: We've identified for you what females students are looking for when they choose a program. Give them the information they need to decide to pursue your STEM classes! Webpage Guides and templates: Websites are now the #1 place that students look for information about their college choices. Encourage female students to consider your program with a Women in STEM website section, or incorporate the information into your school's existing web page. 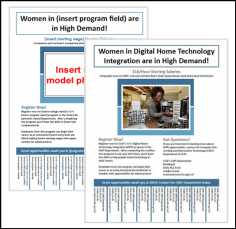 Customizable Templates and Samples: 1) Recruiting Women to STEM Brochure, 2) Tear-Off Flyer with program contact information, and 3) Women in STEM Career Event Flyer. Women in STEM Recruitment PowerPoint Presentation: Use the slide templates and samples to create a recruitment presentation that will encourage female students to enroll in your STEM program. Sample Recruitment Email: See an example of a recruitment email that was effective for another STEM program. Templates in Microsoft Publisher and PowerPoint: All templates include instructions that are easy to follow -- even for beginners! Use this fill-in-the blank template to create a recruitment brochure that will get female students interested in your STEM and CTE programs. Include your program contact details so students will reach out to you for more information. This presentation will help you tell the story of women who have succeeded in your program and have rewarding careers in your STEM and CTE career pathways, and inspire other female students. Includes templates for 22 slides for a Women in STEM Recruitment PowerPoint Presentation. This outreach flyer will help attract female students to learn more about your program. Fill in the blanks with your program details so students can contact you for more information. With this questionnaire, you learn exactly what to ask role models in order to develop an effective written biography, role model video, or prepare role models for presentations. These stories, from real female role models about their education and careers, will engage female students and encourage them to consider your STEM program. We've identified the critical information that females students are looking for when they choose a program. The Program Information Worksheet helps you as you collect this vital information on your courses, program, career pathways and employment opportunities. This Outreach Kit could be helpful for every science, technology, engineering and trades educator in your school, or even your district or region. Order a: 1) School License; 2) District License; or 3) State License. Simply choose which license you prefer during check out. "I know I overused my daily quota of exclamation points but you have got an exceptionally good product here! I appreciate these great creative kick-starts!" Your computer must have: Microsoft PowerPoint 2003 or later; Microsoft Publisher 2003 or later; and Adobe Acrobat Reader.